A few years back we wrote about the Cigarette Racing 50′ Marauder speedboat which was inspired by the Mercedes-Benz C63 AMG. 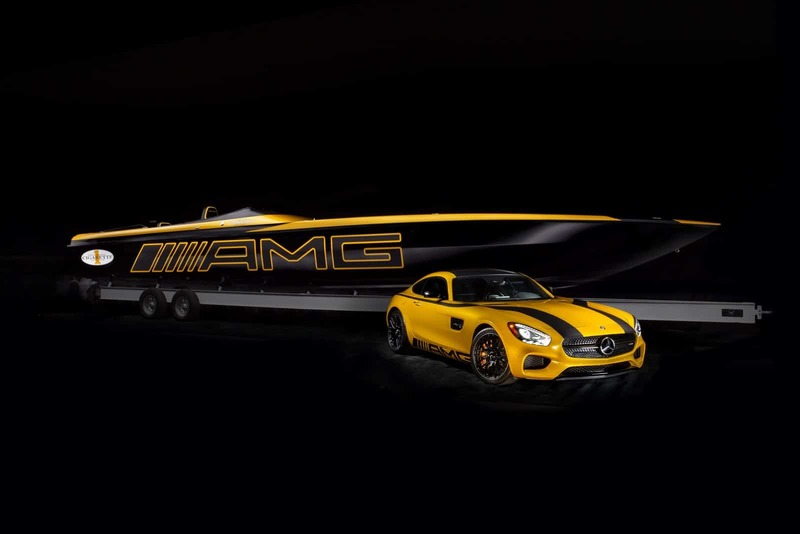 These two companies have been working together for years now and their latest creation is yet another 50-foot Marauder speedboat but this one takes inspiration from the mighty Mercedes-Benz AMG GT S.
The boat is being presented at the 2015 Miami International Boat Show which is open to the public from February 12th to the 16th. While the Mercedes-Benz GT S puts down 503 horsepower from a 4.0-liter twin-turbo V8 engine, the Cigarette Racing 50 Marauder GT S uses two Mercury racing engines putting out 1,350 horsepower each! Make that 1,550 horsepower each if you use 116-octane race fuel! The boat is capable of hitting a top speed of 135mph. I don’t think I’ve ever reached that speed in a car so never mind in a boat…on water. Each engine is also electronically-limited to 1,550 pound-feet of torque for a combined 3,100 lb-ft. Imagine the pulling power of these bad boys. According to Cigarette Racing, their partnership with AMG on composites and bonding has helped them drop 1,000 pounds off the Marauder GT S Concept when compared to the standard twin-engine Marauder which weighs in at 14,200. Customers can request the weight reduction in the standard Marauder but apparently the extra weight contributes to a smoother ride. As the name would suggest, the boat measures in at 50 feet in length and is eight feet wide. The vinyl ester resin and fiberglass boat matches the Solarbeam yellow paint job with the coupe it takes its inspiration from. The cockpit of the boat includes four high-resolution displays, Bluetooth connectivity, Garmin and Cigarette navigation system, and ‘Pure’ JL Audio sound system. The cost of this boat is $1.2 million which is $300,000 more than the standard Marauder SS.